Happy 8th Thirty One Anniversary to ME!!!! I can’t believe eight years ago today, I started this journey. For many, staying 8 years at a job, any job, is amazing! I will admit in my own life, before recovery, I jumped from job to job always looking to make more money. More money equaled prestige, a title and deep down allowed me to bury my lack of confidence a little further. It wasn’t until I entered recovery the first time, I started to see happiness was more than just about the money, it was about making a difference. Over the last few weeks, I have been thinking a lot, trying to remember life 8 years ago. 2011 was a crazy time – I got married to the love of my life after a 9 year engagement, I left a job I loved because of commuting and health issues and my relapse took on a life of its own. Why am I talking about all of this? As I mark my eighth anniversary with Thirty One I realize the difference it has made in my life. Despite the many times I thought about quitting because I wasn’t “as good as” or “didn’t have a good month” or “didn’t earn the leadership trip” or any of the other comparisons/excuses I made – I stuck with it. God had a plan and even through my relapse, I felt it. For those who don’t know my Thirty One story, here it is. Did I remember it myself? NO! I’m grateful for blogging because it helps me to remember. Here is how the story goes…..
See, the truth is I joined Thirty One in 2009 and didn’t do much with it. Yup, I was a kitknapper. I had a few sales but nothing much and it wasn’t long before I went inactive. I was nervous and being a “people pleasing person” I told her I wanted to earn some extra money. I had a good job – Chief Operating Officer for a non-profit and who had time for much of anything else. BUT the truth was, deep down I had a big dream but fear and doubt crept in along with Negative Nellie so I stuffed it down deep. I started sharing the products at vendor/craft shows, not wanting to do home parties and really not interested in having a team. Recruiting wasn’t an option because I joined the day before the FREEZE. No, not the weather although it was cold; Thirty One froze enrollment because they were growing so fast. I was relieved. I had been doing craft/ vendor shows for over 20 years, so it was going to be easy. Hope listened and said she would be there to help when I needed her. No pressure just support and kindness. So started my journey with Thirty One. I did LOTS of vendor events. Fear and doubt kept me company. I didn’t have much confidence – I know amazing, right? This was so far out of my comfort zone. I was a grant writer and social worker, what did I know about sales. I had several failed attempts at my own business so what was I thinking? My first TWO potential recruits came during the “freeze”. I was honest with them, I was going to be learning along with them. Believe it or not, they still joined as soon as the freeze lifted and quickly qualified with $1,000 in sales. I was now a Senior Consultant and in Leadership. YIKES! I wasn’t sure what it meant but it was okay. I was having fun and slowly building confidence. Then my first home office lead wanted a HOME PARTY! Panic set in… it was someone I didn’t know and I was clueless. I stumbled my way through it – no additional parties bookedbut I had sales and it was kind of fun. My FIRST Thirty One National Conference was August of 2012. It was there I set a goal and decided to write my dream on paper – I was going for Leadership. The goal was to be Director BEFORE National Conference 2013. The stats say those who go to national conference earn more – TRUE! Those who go to national conference – PROMOTE – TRUE! In October, 2012 I was a Director in Qualification and in January 2013, I earned my $1,000 Director Bonus. I had gained confidence as a consultant but being a Director brought new fears and challenges. At National Conference 2013, I was joined by my daughter and members of the Rays of Hope Team. I walked across stage and was CELEBRATED as a NEW Thirty One Director. Tears of joy flowed freely all weekend and continue each time I think back to the moment. Hope Shortt, my Senior Executive Director, hugged me on stage. It is weird, the MS has stolen the memory but the emotion of walking across the stage stays with me bringing me to tears each time I think of it. Since then my why has changed so much. I no longer work full-time due to health reasons. We rely on my Thirty One business as the second income in the house. It pays my credit card debt as a result of my relapse as well as some standard household bills (groceries, cell phone, cable and meals out). It allows me to work from home as I struggle with my MS. I struggle with my “why” and learning to DREAM BIG. I still get nervous before a Home party. I struggle with personal development and fighting my haunting inner gremlins as processing thoughts are difficult most days. I am blessed with a sisterhood across the country who helps me when I am struggling, who celebrates with me and who encourages me when I struggle. My team inspires me everyday. They accept me for who I am and have helped me to learn to love me for me. One of the biggest blessings is the support from the Pink Bubble Warriors. A group of Thirty One sisters with chronic diseases. Together we inspire each other. I gained some of my confidence back which was lost in HIGH SCHOOL. Yes, I earn FREE products! Yes, I earn a commission check every two weeks! Yes, I found a sisterhood I didn’t know existed in my Thirty One sisters! Yes, I have grown in my walk with God, learning to trust and believe his will will be done in my business! The benefits have definitely outweighed the negatives of those rough months. This past year has been a true struggle – accepting my relapse, and the need for a twelve step recovery program to help fight the demons in my life. It is the result of vision casting with the Beacon of Hope Team (my upline’s team) which has helped me to focus on my why again. To Make a Difference in as many lives as possible while becoming debt free – is what keeps me going every day. It can be a little act of kindness with happy mail or a hug to delivering a welcome basket to a new single mom moving into her forever home. It is those things which keep me going when I am not sure what to do. A $99 pink box eight years ago, CHANGED MY LIFE. Could it be the thing which changes yours? Have you ever been in the middle of a sentence and forgot what you were going to say? Or maybe you want to use a word in a conversation but can’t think of it? Or maybe even use the wrong word the wrong way? Or better yet, have someone say something and you are clueless on what the meaning is of a word so you don’t understand what they said. I know everyone has it happen on occasion, right? This past month has been a struggle to find the right words from writing my blog to talking to people to even working with customers in my business. I usually can play off not remembering the names of products or prints when talking to customers – I mean I know what the best product is to solve their particular need, I just can’t remember the name of the product. I may remember customer’s faces but 99% of the time, I can’t remember their name. Then there are those moments when hubby tells a joke and then has to explain it because I didn’t process any of the words. Why am I tell you all of this? It has been awhile since I shared about my struggle with MS. On the outside everything seems to be great while on the inside there is a never ending struggle to keep my life the same as it always has been. We all use words ALL the time. From speaking to thinking them in our head or writing them down on scraps of paper. Not a day goes by without the use of words. My words seem to come out all mixed up. It is like someone poured all the words in my head into a blender and then dumped the chopped up words on a table. Some where along the lines, the words get lost. Thankfully when I write, I can proofread and wait before I hit send on an email or post on social media.. Otherwise, my sentences would have words which don’t belong or the sentence would ramble on forever. The scary part for me is when I talk. I will say something and then pause for a moment wondering “What did I just say?”. Most people are polite and just smile if what I said makes no sense. While others will question what I said or meant which causes more frustration for me. Then there are those times when I “thought” I said something or asked for help with something only to find out the words never actually came out of my mouth. UGH!!! I hear everything correctly in my head but the words coming out of my mouth…well, they aren’t the ones I was thinking. It’s crazy how the filter between my brain and fingers, or my brain and mouth, seems to get things all mixed up. Even when I am trying to read aloud from a piece of paper – my tongue seems to have a mind of its own. I wonder if there’s a replacement filter I can install? They make filters for the car which is replaced after so many miles of use. My air filter in my office gets replaced after some many months. Our water filter gets replaced every 6 months. Maybe I can get a filter replacement for my brain? I thought auto correct was the solution. WRONG! Auto correct messes me up even more. It rewrites my words into different words and inserts random words into sentences which has nothing to do with what I’m trying to say. The end result – I get more confused then I already was. Is that possible? Life with Multiple Sclerosis. I’m learning to laugh about situations or at least be honest and tell people what is happening. No, I don’t look like I have MS. This crazy disease is playing havoc on the inside of my body – messing with my words, making my arms and legs constantly tingle and robbing me of my memories. There are many auto-immune diseases out there which play havoc with people on the inside while their outside appears to be “normal”. Maybe not to them because they are living with the craziness of their disease. So the next time someone stumbles on their words, says something totally out of wack in a conversation or seems clueless in a conversation – have some patience for you never know what may be happening on the inside. Will You Step Out of Your Comfort Zone? Yes, it is Monday and we are SEVEN days from Christmas. Your to do list is a mile long. Maybe you still need to buy gifts (yup, that’s me) or you need to mail stuff out (yup, that’s me too) or maybe you are totally organized, finished with everything and enjoying the moment (so jealous!). This is my first week without anything on my calendar as far as events or parties, etc. I set this week aside to catch up on things personally and get ready for the holidays. While I am doing things, I have lots of time to think. I will be driving around in lots of holiday traffic so what better time to start thinking about the new year – personal and business goals for 2018, what will be on my vision board and of course, my word for the year. Today I want to ENCOURAGE you to put something on your list of goals for 2018 which challenges you to step outside your comfort zone. I often talk about stepping outside of my comfort zone but when I look back at the past year, I wonder “did I”? Was raising the price on my angels out of my comfort zone? YES! Did it scare me? YES! Was I afraid they wouldn’t sell? YES! The truth was with some encouragement from some amazing ladies, I trusted their business sense and went with it. It worked. I may not have sold as many depending on the show BUT customers put more value in the work I did. When I think of my direct sales business, the biggest step out of my comfort zone was running 95% of my business online. It really wasn’t scary. The scary part was locking into a Facebook party style and sticking with it, no matter what. Did it fail sometimes? YES! Did it rock sometimes? YES! Will I continue with the same format? Absolutely! Do something which scares you, or maybe even terrifies you. Do something you have never tried or maybe haven’t done well in the past. What about the thing you have thought about but put off? How about trying a new way to party to build your business…like social media and Facebook partying?! Direct sales businesses are changing every day. It seems everyone is all about partying online, and growing their social media presence. Building genuine relationships can be difficult. I like to TALK to people so building my business online via email, messaging on Facebook and Instragram is really “out of your comfort zone”. What about you? What type of activity in your business makes you feel uncomfortable? Try it! Go for it, I DARE YOU!! I encourage you to come up with at least ONE thing you are going to do to step outside your comfort zone and work on. It doesn’t have to be a monetary goal, how much you are going to sell each month, how many parties you are going to have, etc. It can simply be something you are going TO DO or actively be involved in because of your business. It can be so much more than recognition stats. So, I ask you: How are YOU going to allow your business to grow you in 2018, in a way which maybe uncomfortable, uncertain, scary, exciting but could lead to things you could never even dream of? Today’s Saturday Spotlight is on a local business run by a friend of mine, Cress. I bought one of these as a gift for my mom for Christmas. She loved it and everyone she showed it to thought it was AWESOME. Not the usual “trinket” but something which conveys a special message to the one receiving the gift. 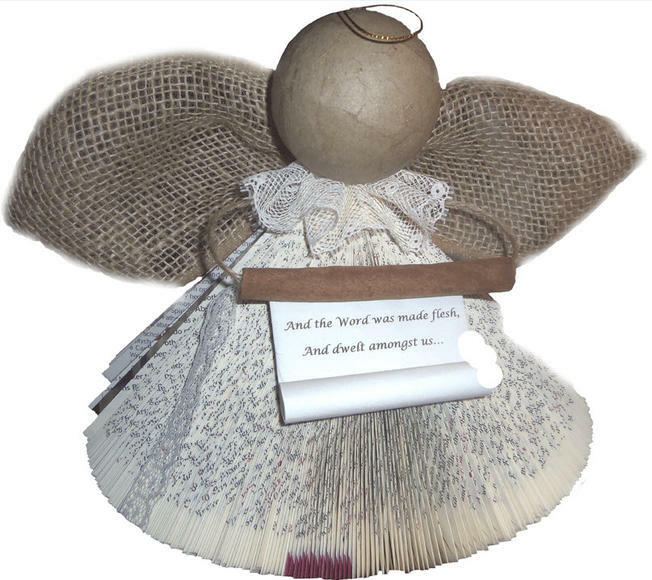 The creation of our “Angel of The Word” figurines was inspired by the desire to re-purpose the beautiful Magnificat monthly prayer books once they became outdated. I felt they were too special to be thrown away…and in sharing this Angel with others, I have found that I was not alone in how I felt…as it was not long before I became the recipient of these recycled prayer books via the thoughtful donations of those who desired to see more angels this side of Heaven. Only in late September of this year, was I prompted to make more of these angels…and the greetings / verses have grown in number and, as with God’s Word, the possibilities are endless. Stop by her website and check it out. Don’t see a message you would like, let her know. She is AWESOME at finding things to fit your special need. A new Thirty One year starts today! Every year (actually twice a year) I look back on my goals and evaluate what went right or what went wrong. I don’t focus on the negative BUT I do acknowledge it so I know the changes I want to make in the new year. Over the last year, there have been some noticeable changes personally and professionally in my business. I have been saying and visualizing daily mantras to combat those nasty inner gremlins – the result, a more positive attitude. The more positive attitude has rippled into a stronger marriage and a stronger business. I am learning to be ME! At age 60, you would think I have this down pat but alas I don’t! I used to practice my 30-second commercial so much, it felt canned and never really natural. So, what did I do? Changed it from a practiced commercial to “I help busy woman with simple organizing solutions so they can enjoy quality time with family and friends”. I am a walking billboard with Thirty One products so it is easy to then share how they help me to stay organized. But my image is more than my 30-second commercial… it is also about how others perceive me. I’m a jeans girl. When I was working in the non-profit world as a Social Worker and then as a Chief Operating Officer, I wore jeans with comfortable shoes (no sneakers) and a nice shirt. As a direct sales consultant, jeans and a company tee shirt have been my attire for as long as I can remember. But I will admit, getting older and closer to goal weight, I am changing things up a bit. Nothing costly or dramatic just enough to let my sparkle shine through. Do you remember the show “PanAm Girls” (I said I was OLD!). These flight attendants were well groomed ALL the time, top notch, first class all the way. Their hair, makeup, jewelry and clothes had everyone wanting to be just like them. What do you think of when you think of First Class? In direct sales, we are “on” all of the time. Do people think you are well put together or a hot mess? People pass judgement on us without us even opening our mouth. Our clothes have a language all its own. I’m not sure if mine don’t show I’m a hot mess more often then I want. Always where solid colors to a party or event. You certainly don’t want to clash with your products. As a Thirty One consultant, we have lots of prints to show so this makes sense. Be genuine, gracious and acknowledge others. To me, this is a no-brainer for we Celebrate, Encourage and Reward our customers and hostesses. This also is a great way to use Dana Wilde’s 10-second rule. Little details make up the big picture. Pay attention to the little details your customers or potential customers share with you. When I am at an event or party, I even make notes on the order forms so I can remember something about the customer. Dress to showcase the best you. Leave the tennis shoes at home. Stay away from clothes which are too tight or too big. Instead of jeans and a tee why not khakis and a tee. I have started wearing more of our jewelry and makeup to parties. If you saw you, what would you think? Are you an all together girl? Or are you a hot mess? When I think of an all-together person, there is a women at Weight Watchers who always looks FIRST CLASS. Color coordinated, hair done, makeup, jewelry, etc. and she is just weighing in. I always tell her I aspire to be like her. You are what you wear even BEFORE you have a chance to give your 30-second commercial. I have also found my angels help me to stand out from the crowd. A handwritten thank you with an angel goes a long way to someone remembering who I am. The “ThirtyOne Angel Lady” as I am known by some fellow vendors. What have you got to lose, right? Who knows,you may recruit more and sell more so isn’t it worth a try? Time for a haircut or at least to clean up my current hairstyle. How about you – do you portray a first class image or a hot mess?